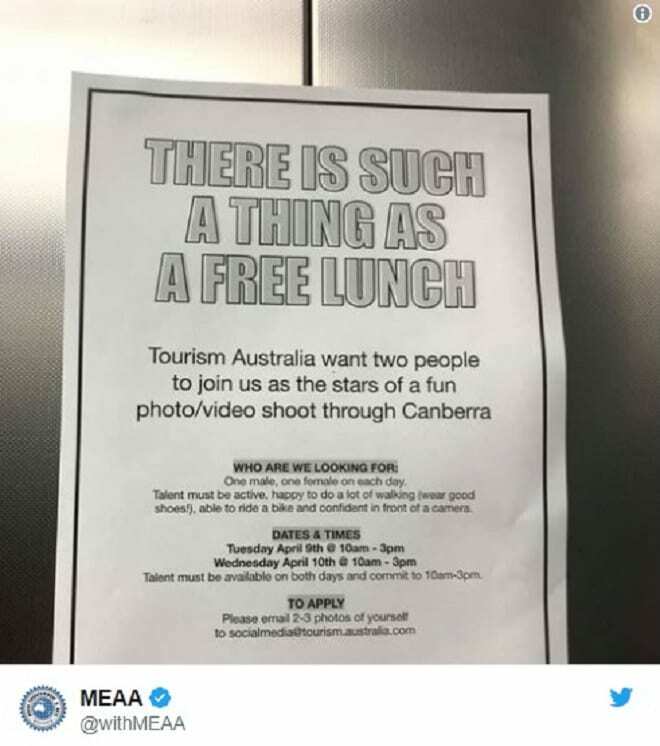 An advert pinned up in a Canberra hostel calling for two young people to star in a video promotion for Tourism Australia that would have seen them paid in food only has drawn criticism from both media organisations and the general public. “There is such thing as a free lunch,” the ad reads. It asks for the pair to be available between 10am and 3pm on two days of the week. “While this is an unpaid activity, lunch will be provided each day and all activities are free of charge,” it reads. Speaking to Yahoo News, a Tourism Australia spokesperson said the poster should not have been created as it “did not reflect its normal practices around the use of talent”. “This is only something we became aware of on Tuesday night. We immediately asked for the poster to be removed,” the spokesperson said.